Mumbai: In a surprise support to Hindutva brigade, which is for long demanding a ban on 'azaan on loudspeakers', few Mumbai Muslims Saturday expressed concerns over the rising misuse of loudspeakers from mosque minarets, some even suggesting that loudspeakers were actually defeating the purpose for which the muezzins call out to the faithful for mandatory prayers. "Azaan is mandatory to namaz, not the use of loudspeakers. Azaan should be sonorous and easy on the ears. If loudspeakers are inconveniencing fellow citizens, I would say the mosques should remove them before the police take action," says senior community leader Dr Mohammad Ali Patankar is quoted by The Times of India as saying. 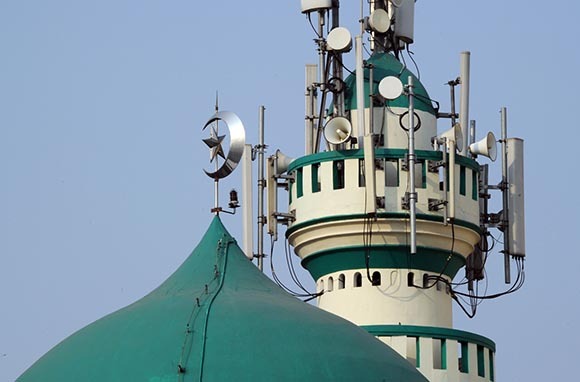 An activist Saeed Khan has also expressed concern over the misuse of loudspeakers saying Saboo Siddique Hospital and a nearby municipal school have to endure the long, high-decibel azaans every day from a nearby mosque. "Normally an azaan should last two to three minutes, but here the muezzins at both the mosques give azaans which last longer. It is competitive religiosity and both groups try to outdo one another in proving their respective superiority," Khan said. Khan also complained that at many Sunni mosques the practice of reciting "salam" (devotional verses in praise of the Prophet) after the fajr (morning) prayer causes "pain" to many people. "I have no problem if the salam is recited by those who are praying inside the mosque. Why should it be amplified to disturb those who are sleeping in the morning?" Khan said. "If Muslims have the right to give azaan, non-Muslims have the right to sleep peacefully", he said. The observations came after the Bombay High Court direction to the police last week to remove "illegal" loudspeakers from mosques. In New Mumbai, under the banner of Muslim Ekta Forum, community members have decided to approach the court against the rule that says that loudspeakers should not be used between 10pm and 6am. "Our morning namaz is held around 5am. We are planning to challenge this rule and want exemption for it. We have told the mosques' managements to follow the rules," Forum's president Ali M Shamsi said. Congress and caste parties decimated, whither Indian Muslims? Amit Shah as BJP chief: Modi sidestepping RSS? Save Gaza Today; Tomorrow May Be Too Late!